Fine Wine & Gourmet Dine Tour! I’m delighted the super Fine Wine & Gourmet Dining Short Break Wednesday April 25th – Thursday April 26th in Jumilla, with an overnight stay at the luxurious Boutique Hotel, Casa Boquera, ideally placed between Yecla and Jumilla! On the way to the hotel we will visit the excellent Bodegas Casa Rojo where we have a tour and Wine Pairing Lunch, where we will taste 6 of their excellent wines, made in different areas of Spain, each paired with a different dish! At Casa Boquera, after checking into the luxury rooms, we will have dinner, served with their own Gold Medal winning Bodegas Boquera wine! In the morning, after a buffet breakfast, we will make our way to Bodegas Finca Luzón, where we will tour their wine-making facility, followed by lunch in their cellar, served, with some of their top wines! A very special two day break – for 285€ per person. For more details call 629 388 159 or e-mail colin@colionharknessonwine.com NB only 14 places left! Another of our very popular events, bringing together some of the finer things in life! Saturday 25th November Claire-Marie (www.clairemarie.es) and I will be presenting a wonderful four course dinner at Club Nautico, Restaurante Bela Dama, on the beautiful Moraira Harbour. Each course will be paired with a fine wine, and we will also be enjoying the wonderful: Flute Favourites, Popular Opera, Classical Music, Songs from the Shows, and contemporary numbers too – all with the pure Soprano voice of Claire-marie! This is an invitation only event to be held at Javea Golf Club, 10th November. There will be a 10 minute Power-Point Presentation whilst attendees sip a glass of chilled Blanc de Noir Sparkling Wine made from 100% Bobal; followed by tasting a top Bobal Rosado and two red Bobal wines, in fact the highest marked Bobal wines in the Peñin Guide! There will then be super tapas served in the convivial atmosphere always prevalent at such occasions! 18th October is the date for a private wine tasting event for a group of Swedish visitors to Javea. Although this is a private event, I mention it to inform readers that this is something I often organise – perhaps you would like to have such an event for your friends/group/association/club/business? Please contact me! 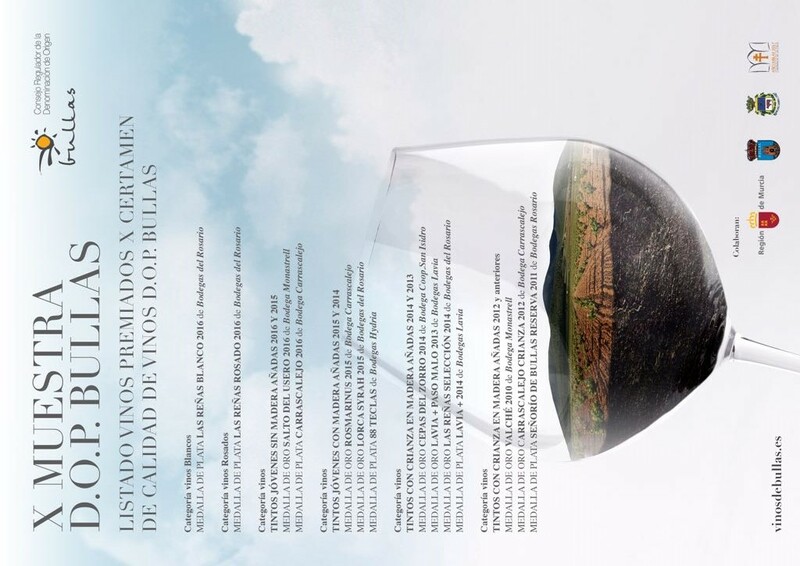 Quite why this is displayed like this, I’m not sure – but I hope you can rotate it and read which wines from which bodegas were the medal winners at this year’s DOP Bullas Wine Competition!